I'm going to start off with the latest addition to my collection, the Ofra Glazed Donut Highlighter(£25). This highlighter is actually in collaboration with NikkieTutorials who is literally the queen of highlighter, so of course I had to have it. There are a few other shades that she created with Ofra but Glazed Donut looked like the perfect shade for me. It is a gorgeous icy white shade which gives off a stunning metallic sheen once applied to the skin. The texture is an absolute dream too. 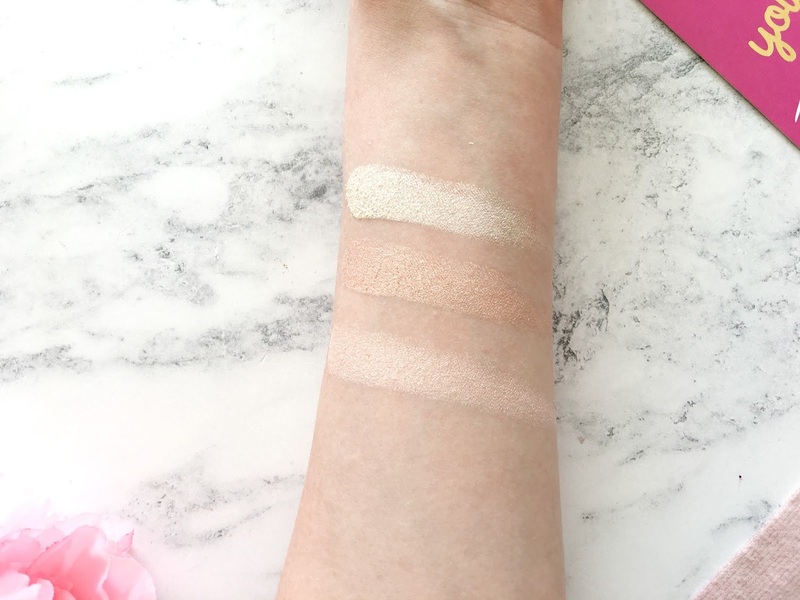 It's incredibly creamy to the touch and it blends into the skin so easily. You only need a small amount of it on the brush too. It is one of those 'wham bam, thankyou mam' kind of highlighters. One swipe is all you need. 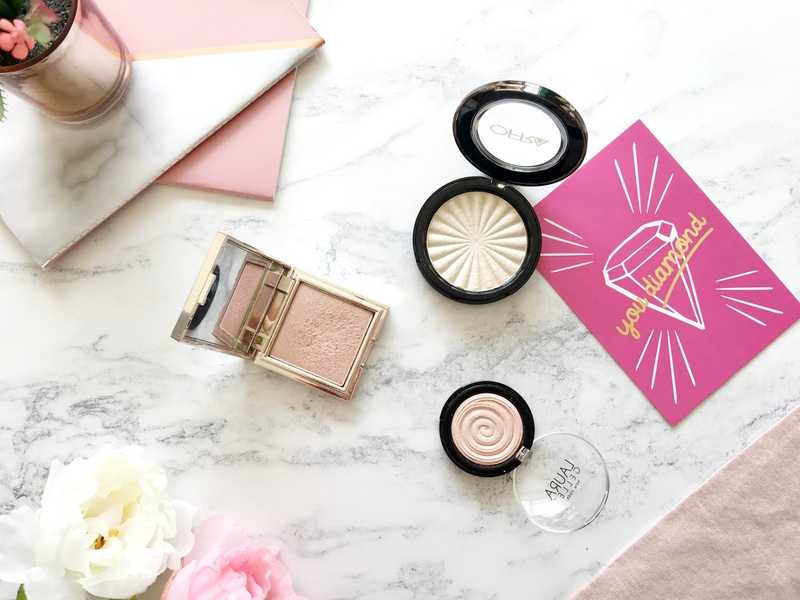 If you are not one for subtlety when it comes to highlighter like me then I'm sure you will love this! If not, then a lighter hand is an absolute must so you can build it up as and when you please. Next up is the Laura Geller Baked Gelato Swirl Illuminator in Charming Pink(£21). Now this one isn't quite as intense as the Ofra Highlighter. In fact I'd say this is the most subtle out of the three. It is a beautiful baby pink pearlescent shade with a powder-cream hybrid texture which I really appreciate. It is very soft and creamy once swatched. It isn't exactly a 'barely there' kind of highlighter, but it's incredibly buildable. It gives off the most amazing ethereal glow. It is absolutely stunning. You can use it wet or dry. I have used it both ways with my RT Setting Brush and I much prefer using it wet as I like a more intense highlight. I find that when I use it dry it gives off a light, sheer glow which I think is more appropriate for a natural makeup look(which I hardly ever do). And last but not least is the Jouer Powder Highlighter in Rose Quartz(£19). I have previously spoke about this in a separate review(which you can read here) so I won't go into too much detail. I don't have a shade like Rose Quartz in my collection at all. It is a stunning champagne-pink which gives off a natural, lit within glow once applied. It has such a wonderful buttery texture which makes applying it an absolute dream. It is extemely blendable and it doesn't go patchy at all. It is so flawless. I was completely obsessed with this highlighter when I first bought it but the Ofra Glazed Donut Highlighter has recently replaced it. Don't get me wrong I still absolutely love this, but I just love the Ofra one so much more. This does come in a close second to the Laura Geller Illuminator though.